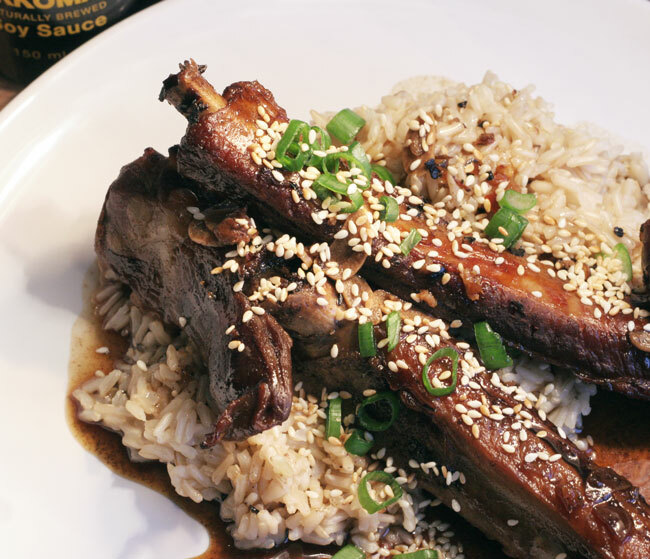 For Father's Day we made the bestest Soy Glazed Ribs you can imagine. My dad had to work, so I didn't cook this meal for him but cooked it more as a tribute. The recipe reminded me of his beef and "black egg" stew, which used to be one of our favourites when we were kids and no one cooks this stew like Papa Din does. I came across this recipe on one of my all time favourite food blogs Spoon, Fork, Bacon and thought yep we'll give this a go and make it our own. There was a little resistance from Mat, because ribs are hard to get right and no one likes chewy bits of meat that hold onto the bone for dear life. But once he tasted the fall off the bone pork, smothered in the sticky soy and honey glaze he was sold. Served alongside a generous portion of brown rice and an iced cucumber salad this dish is a real hit. To me it tastes like genuine Chinese food, fresh and flavoursome and not even close to any of the gloopy dishes you get from your Chinese takeaway. We are definitely making this again and next time we'll have dad around ;). Mix all the salad ingredients in a bowl, stir thoroughly and place in the freezer for 10 minutes. Then take out and refrigerate while you're cooking the ribs. Rinse the ribs under cold water and place in a large pot. Fill with water and add the sliced ginger. Place pot over high heat and boil for 30 minutes, skimming the fat from the surface as it forms. Drain and rinse rib pieces in cold water for a second time, removing any excess fat, debris and ginger. Pre-heat the oven to 170˚C. Place a large Dutch oven, heavy bottom pot or any other large, oven-proof pot over medium-high heat and add oil. Add the ribs and season with salt and pepper. Brown for about 3 minutes. Add the ginger, chilli and 5-spice and cook for a minute or so. De-glaze the pot with the wine and leave to bubble for a few minutes. Now add the sugar, soy sauce, garlic and honey. Bring the mixture to a boil then cover and place the pot in the oven. Cook for 45 minutes. Stir occasionally and turn the ribs. For the last 15 minutes remove the lid. Scoop 160ml (approximately 2-3 ladles full) of the sauce into a small pot (skimming off any excess fat) and stir in the honey. Simmer for 15 to 20 minutes or until the mixture has reduced by 1/3. Remove from heat and allow to cool for about 15 minutes. 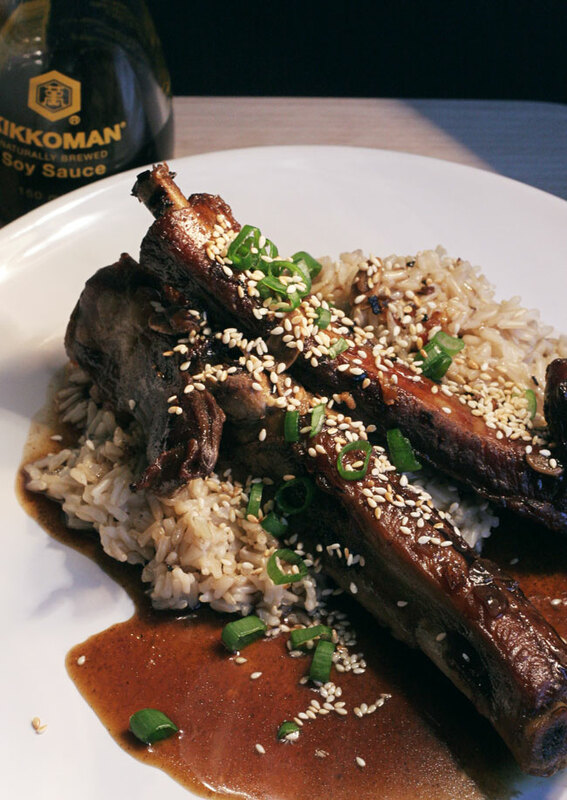 Serve the ribs on top of the rice, spoon over the sauce and brush the meat with the honey soy glaze. 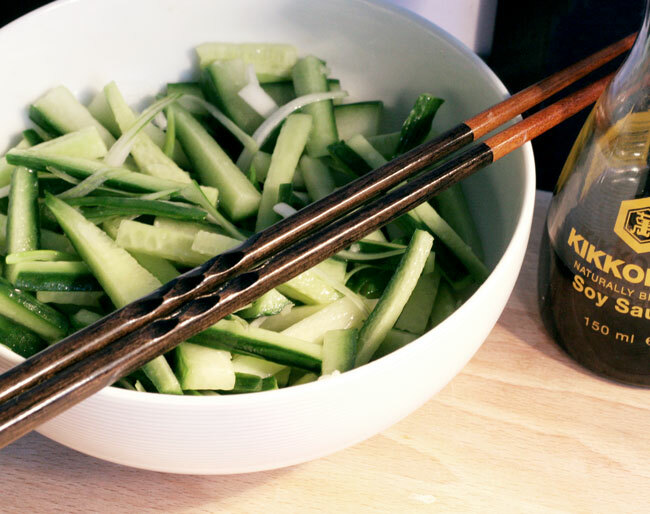 Top with the spring onions and sesame seeds and serve alongside the iced cucumber salad. We enjoyed this with an ice cold glass of Tsingtao beer. These look amazing! You always have good recipes. Aaaw thanks Charlotte... will try and make this recipe (and other posts) posting business a more regular occurrence. omgosh the recipe is so detailed!